Posted on Wed, Apr 4, 2012 : 6:44 p.m.
Ann Arbor firefighters hose down the side of a house that caught fire Wednesday on Waldenwood in Ann Arbor. A home in the 3000 block of Waldenwood Drive suffered burn damage Wednesday after a grass fire spread to the home and caused the attic to go up in flames. 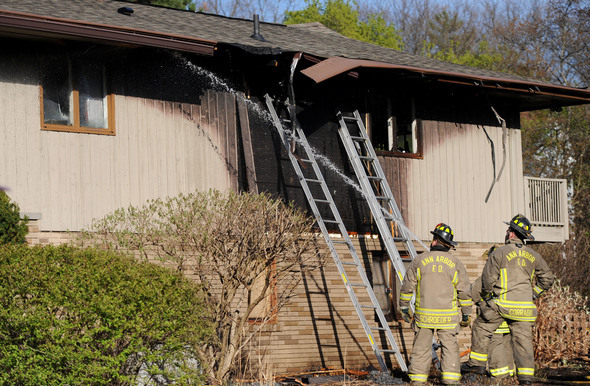 Ann Arbor fire Captain Randy Menard said the fire began at 5:02 p.m. and the first crew was on scene seven minutes later. By 5:30 p.m., the blaze was extinguished, he said. Menard said the homeowner was burning weeds outside the home, which caused the grass on the lawn to light. The grass fire then spread to the side of the house and up into the attic, Menard said. No one was injured, although the homeowner's wife did complain of a sore throat, Menard said. She did not seek medical attention. Menard said bedrooms inside the home were damaged, along with the roof and siding that had burned. Firefighters had to break through the home to make sure all the insulation inside the residence was free of embers, he said. A monetary estimate for the damage was not immediately available on Wednesday. Thu, Apr 5, 2012 : 8:16 p.m. I believe burnign is illegal in Ann Arbor. Like others, I wonder why this issue wasn't a part of the article? I don't usually complain, but this is a rather egregious error on the part of the reporter. Thu, Apr 5, 2012 : 7:13 p.m. I was in that neighborhood last night - all told there were SIX fire trucks, one HVA ambulance, the fire command SUV, two police vehicles, one police motorcycle. At least two of the fire were from Pittsfield (address is a long way away from Pittsfield). I wasn't able to see where the others were from, assuming A2 City and Twp. I saw the activity and was afraid the local school was on fire. While a fire is a terrifying event - and I'm grateful no one was injured -- that was pretty darn expensive leave burning event. Anyone know why it was a three alarm fire? Did dispatch think it was the school? Thu, Apr 5, 2012 : 3:36 p.m. I can't help think that, if this were me, the photo would be of me, bent over a police cruiser cuffed! Can you imagine if this fire got up and at em in that neighborhood!!! Ticket/fine this person please, send a message!! Thu, Apr 5, 2012 : 3:20 p.m. I've performed controlled burns of my front yard native prairie for about 10 years. I've always gotten a burn permit and the fire marshal has been quite strict. It now costs $180 to get a residential burn permit. In my permit, all fuel material within 10 feet of the house has to be removed and the area around the house watered down before the burn. Two hoses have to be fully charged and ready during the burn. Unfortunately, this year I was required to hire a professional crew. I fear this accident may forever result in my residential burn permit being denied. Thu, Apr 5, 2012 : 11:32 p.m. The ground around a pile of tree branches watered down before a burn. Makes sense that the people who gathered sawed-off tree branches in Dexter and piled them up to burn them would take preventive measures like those that you describe. A cleanup job, not a clearing job. In the village's township, the fire department should be called before burning a big pile of wood, so that neighbors don't call them when the fire begins, not realizing that it was lit for good purposes, not bad ones. Thu, Apr 5, 2012 : 6:26 p.m. I'm assuming this post is from my neighbor Ron, and he is always careful. Goes about the job in a very professional manner. Didn't know Ron had to hire it done this year. Very unfortunate;. Hmmm..... just wondering if the homeowner was attempting a &quot;controlled burn&quot; on native plantings, which most people would unknowingly consider &quot;weeds&quot;. Thu, Apr 5, 2012 : 12:36 p.m. I find pulling them and then putting them in those big brown paper lawn waste bags works better. Glad no one was seriously hurt. Need to get out my weed whacker. What a big oops. Some of the townships do have burning limits and yes, you do need to be careful. Glad they did not loose that house. Thu, Apr 5, 2012 : 11:53 a.m. I believe open fires are illegal unless you're cooking on them. So if you have a fire pit, etc, always keep a weenie nearby. Thu, Apr 5, 2012 : 10:41 a.m.
Agree with a2cents. I thought it was illegal to have an open fire in Ann Arbor. Why would you have a story like this and not address that point--either mentioning that it is legal in certain conditions or against the law? Come on a2.com...do your research. Thu, Apr 5, 2012 : 11:02 a.m. There are products on the market (check out the &quot;Weed Dragon&quot;) that can be used to burn away weeds in lieu of using pesticides. They work quite well, but since they're not much more than a pipe and a valve hooked to a propane tank, they can be dangerous to use near anything flammable. That may have been what the person in question may have been doing when the fire started. Mine is great to use on the patio or other places where kids an pets are going to play, but you've got to be very careful near any dry grasses or wood. Thu, Apr 5, 2012 : 10:24 a.m. I throw in a dooh !! Thu, Apr 5, 2012 : 10:32 a.m.
Thu, Apr 5, 2012 : 1:47 a.m.
Would it violate precious guidelines to ask if open burning prohibitions resulted in a ticket to boot? Thu, Apr 5, 2012 : 1:52 a.m. I wondered the same thing. I guess you could always ask the question in the article about Ms. Taylor, the new assistant fire chief ... there's a couple of fireman who have posted in that thread; I'm sure they'd answer your question.